The sad truth is that many of these properties are left in less than optimum condition. In fact, there is a huge amount of work required to prepare a property for eventual sale. More often than not, many of these houses and property will require extensive repair work and cleanup before they can be sold. And another truth is that cleaning abandoned houses isn't high on any real estate professional's list of favorite chores! While the number of foreclosures was drastically high for a number of years, today the actual number of homes in foreclosure has dropped significantly. The actual numbers are close to what they were before the housing market crash although there has been a bit of an increase towards the end of 2018. While this is certainly good news for the overall housing market, there are still abandoned homes out there. The actual number of homes in foreclosure is still relatively high and the numbers are climbing somewhat going into the winter of 2018. In fact, there are over 550,000 homes in some phase of the foreclosure process. Since these homes sit vacant and sometimes simply abandoned by the prior homeowners, many of them need an initial cleanout. If they stay on the market for long, these houses will require ongoing cleaning and maintenance. Unfortunately, many of these homes are left in very poor condition by previous occupants. This means that many of them require a great deal of work before they are ready to be put back on the market. And that usually means a foreclosure cleanout. Does Your Property Need A Foreclosure Cleanout? Many real estate professionals know from experience that former homeowners who have had to leave their foreclosed property rarely leave them saleable condition. And, on many occasions, these foreclosed homes are often left with piles of trash and abandoned property that the previous homeowners never removed. Because of this, most foreclosed homes require some intensive preparation before they are ready for an open house. Many real estate agents and banks with a large inventory of foreclosed properties have a need to hire a foreclosure cleanout service. This is not to say that they couldn't take care of it themselves, but that's not always the most efficient or cost-effective approach. This is understandable when you consider that most foreclosure cleanouts involve hauling away old furniture, appliances, unwanted items and other junk and debris that was left behind. 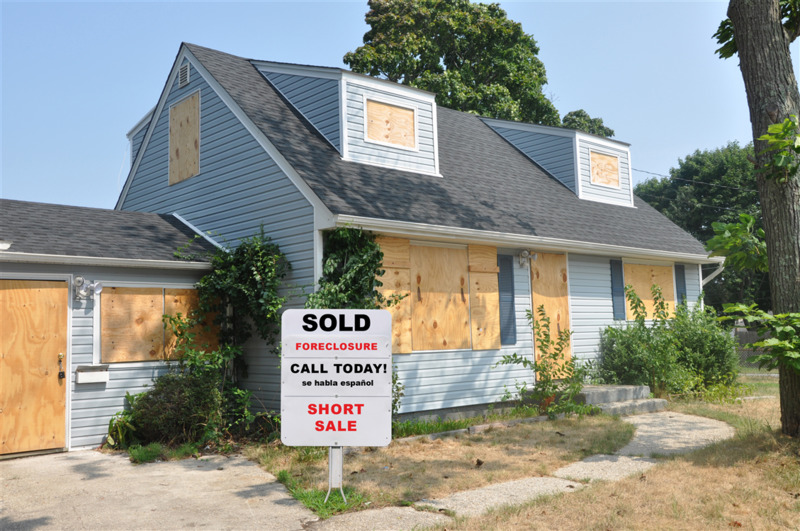 In addition, because of the complex and often time-sensitive nature of foreclosure, short sale and REO transactions, responsible parties often need the cleanout work completed with a strict turn-around time-frame and on short notice. Sometimes a foreclosed home can be sold in an "as-is" state. Either the property doesn't require that the bank or mortgage holder make any major repairs, or a buyer wants to move fact and isn't concerned with the condition of the property. This latter scenario is common when an investor simply wants the lot and plans to sell it or build a new structure there. However, if there are no ready buyers, it may still be necessary to clean out the property prior to staging it for an open house and an eventual sales transaction. Because of the heavy work that is often required smart real estate professionals understand how strategic and cost-effective it is to outsource the work to a professional foreclosure cleanout service like Junk King. A reputable firm like Junk King can offer a number of services to clean and preserve a property throughout the life-cycle of the foreclosure process until the sale of property. We understand the needs of real estate professionals and the guidelines for investor and insurers so all our work is completed in accordance with applicable specifications. Choosing to outsource the cleanout aspect of your real estate deal requires that you determine which firm is the right one for the job. Yes, you can probably find numbers of guys with a truck might be able to do the job, but this alternative can cost you more than you planned on. It never really pays to go with a non-professional for professional work. This is why Junk King really is the firm of choice. Junk King is the leading business-to-business junk removal service in North America and our real estate junk removal services can easily manage the cleanout process for you. It’s one big task off your to-do list and a big step toward getting your property ready to sell or rent. We understand that as a real estate professional you need your properties to be pristine and you want to be able to list them as quickly as you can. We also understand that you appreciate hassle-free services and really can’t afford to have problems with a property. And your clients have enough to deal with when selling a home, so having the chore of junk removal handled by someone else is a huge bonus. One of the best things about hiring Junk King is that we recycle a much of the material we pick-up. This is proof of our commitment to being an eco-friendly removal service. If you have questions about what we do or what we believe, give us a call at 1.888.888.JUNK (5685).